Westport House is nestled in the town of Westport itself and is only a 5 minute drive or 5 minute walk from the town itself. Feel free to leave the car at home – or park up in Westport town – when visiting us! Please follow the signs for Pedestrian Access to Westport House in the direction of Westport Quay – we are located on Church Lane, please turn downhill alongside McCarthy’s Pub. It is a .5km walk from the town centre gates to Westport House, roughly a 5-7 minute walk. If you’re planning on driving, please visit us via our Westport Quay gates. 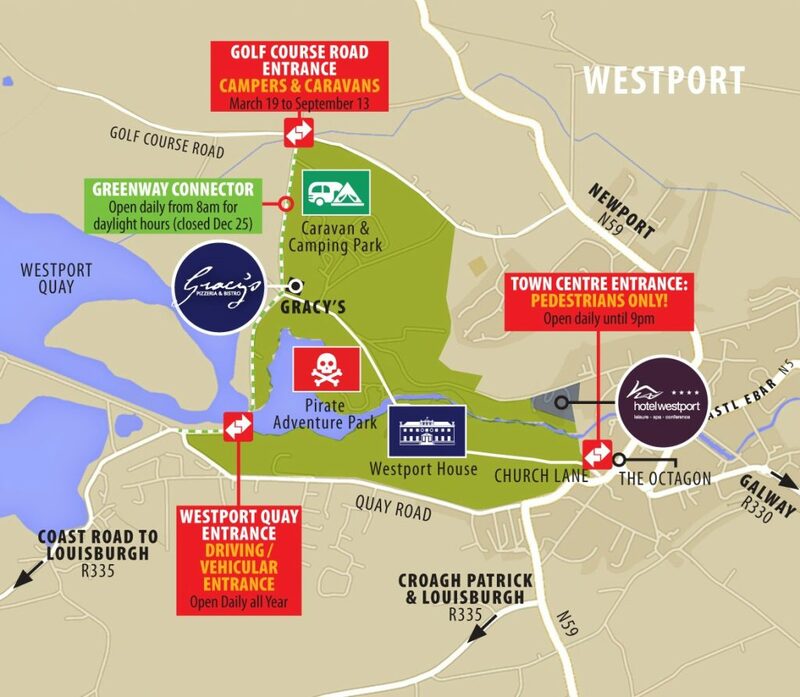 Please consult the map below for driving directions to Westport House or visit http://maps.google.ie for driving directions. Or follow the directional signs upon arrival at Westport. Our GPS Co-ordinates to the Golf Course Road Gates are N53.80550 W9.53574 and to the Westport Quay gates are N53.80024 W 9.54557. And our Eircode is F28 TY45. We have moved! Well, we haven’t as such but we have moved our entrance. All camping vehicles, caravans, campervans, motor homes and campers cars are asked to enter from the Golf Course Road. This is a turning off the Westport to Newport N59 road. Please note new signs in town centre directing you to the new entrance. Please call us for directions on 098 27766 or get directions from Google Maps here. Note these gates are closed when the attraction or caravan & camping park are closed. Our GPS Co-ordinates to the Golf Course Road Gates are N53.80550 W9.53574. Westport is a terminus for Irish Rail offering 4 trains a day as well as having regular bus access through Bus Eireann. Please visit their websites to plan your trip. Looking to rent a car – please contact Budget Rent-a-Car at Ireland West Airport Knock. Our Eircode is F28 TY45.